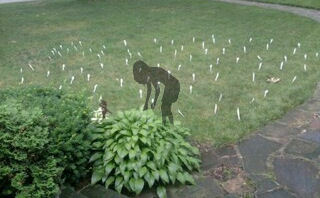 Well, the mystery of the forked yard is now solved. The culprit was a good friend of my daughter, who thought it would be funny. 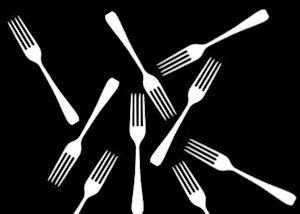 It was funny — although perhaps not unalleviatedly so for my daughter, since she was the one who had to “weed” our yard of 3 pounds of white plastic cutlery. Cross off criminal from your list of career possibilities. Truth to tell, the prank was funny, and posting the pictures was funnier still. It does make me wonder, though, where we draw the line regarding what personal information we share — and with whom. Well, how could the perp resist posting that stunt. It was way better than most of the things those younguns post. Of course, I’m on a privacy list of one (well two now since Josie added my sister to the list), so I can only see posts by a quick look over Josie’s shoulder. I’ve been banned from the beginning. On Twitter, too. She follows me but I’m blocked from following her. Yet another indignity of parenthood.